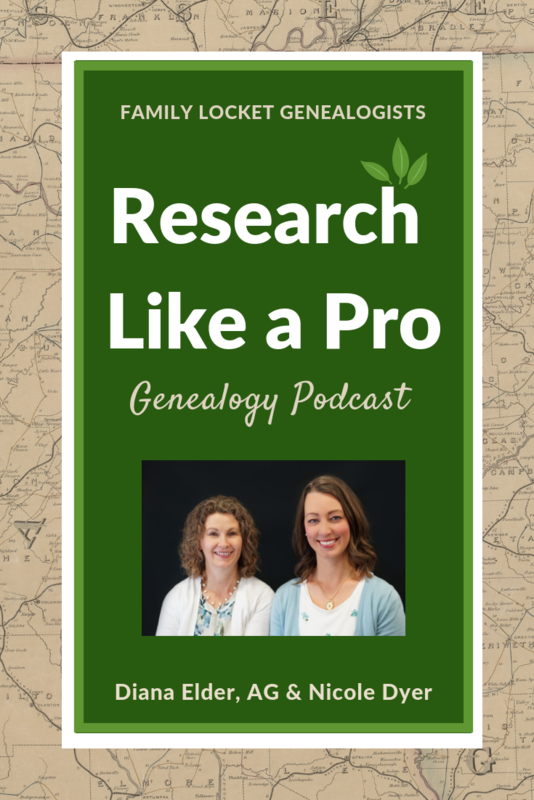 Diana Elder, AG and Nicole Dyer discuss the Research Like a Pro method and how to take your genealogy research to the next level in their weekly podcast, Research Like a Pro. Learn about research objectives, analysis, locality research, research planning, source citations, report writing, case studies, and more. To view a list of recent episodes, click here: Research Like a Pro Podcast recent episodes. If you write a review on iTunes or Stitcher, we will read it on the podcast. Please also ask a question in your review and we will try to answer it! To receive the weekly episodes, subscribe on iTunes, Stitcher, Google Play, or your favorite podcast app. You can also sign up for our newsletter to receive notifications of new episodes. “This is a great podcast for both beginning and experienced genealogists. Beginners can learn the how to do genealogy the right way from the start. I wish this process was around when I started genealogy – I would have saved a lot of time and effort! Experience genealogists will learn something new from the discussion of the various tools and tech that Nicole and Diana use.